Postoperative fever after cardiac surgery is common and requires a planned approach. Published data about the frequency of postoperative fever in cardiovascular surgery are limited, and the Figure varies from 12% to 73%. ,, Most fevers that develop within the 48 hours after surgery are benign and self limiting. Fever that develops after first 48 hours following surgery is more likely to have an infectious cause,  but noninfectious causes that require further evaluation and treatment must also be considered. It is necessary to have a focused systematic approach towards postoperative fever in the pediatric cardiac surgery patients so that prompt and adequate treatment can be instituted cost-effectively. 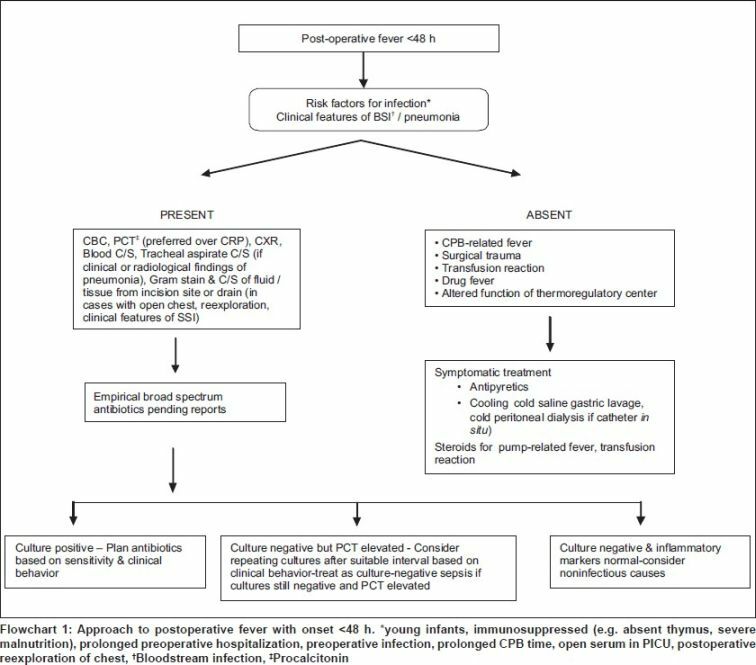 In this review, we briefly discuss the common causes of postoperative fever in children undergoing cardiac surgery and the systematic approach to establishing the etiology in a particular patient. We abstracted the most significant published literature on the electronic databases, namely, PubMed and Embase applying specific search terms such as "Postoperative fever", "Postoperative fever in pediatric cardiac patients", "Nosocomial infections", "Nosocomial infections in pediatric cardiac patients", etc. We have also assessed abstracts of conference/meetings; consulting authors/experts in the field; and standard text books. In general, the postoperative fever is considered to be associated with the metabolic response to trauma, duration of surgery, the accumulation of blood in closed spaces, presence of drainage tubes, drugs administered during the perioperative period, and infections. ,,, In cardiovascular surgery, this postoperative fever has generally been related with the use of cardiopulmonary bypass (CPB), hypothermia, and the post-perfusion syndrome, ,,, as well as infection and blood transfusion. ,,,,, Rectal temperature exceeding 38°C is generally considered to be clinically significant. While axillary temperature is easy to measure (compared with oral or rectal measurements), it has been found to be an inaccurate estimate of core temperature in children ,, as it is largely influenced by environmental conditions. This is especially important in postoperative cardiac patients who may be having cold extremities with low skin temperature due to low cardiac output state. General causes of fever in the postoperative period can be classified into two broad categories: Infectious and non-infectious [Table 1]. The incidence of postpericardiotomy syndrome  following surgery, in which the pericardium has been opened, approaches 30% although patients younger than 2 years of age appear to be less commonly affected. Postpericardiotomy syndrome may cause fever, malaise, chest pain, pleural effusion, raised ESR and on occasion, arthralgias. Treatment is directed at relief of pain with anti-inflammatory agents, diuresis, and drainage of symptomatic effusions. Aspirin has been the mainstay of therapy in children. Nosocomial infections in children after heart surgery occur in 12.9 to 30.8%. ,,,, Bloodstream infections (BSI) are one of the commonest nosocomial infections ,, seen in children undergoing cardiac surgery with studies reporting an incidence as high as 65% of total nosocomial infections. Infants with sepsis can have fever (>38°C rectal), hypothermia (<37°C rectal), apnea, or bradycardia or tachycardia with no other recognized cause. Central line associated blood stream infections are laboratory-confirmed BSIs that are not secondary to an infection at another body site in patients with central line in place at the time of or within 48 hours before onset (of event BSI). Lower respiratory tract is another common site for nosocomial infection in the postoperative period. , The diagnosis of pneumonia is based on a combination of clinical, radiological, and laboratory findings. Patient on ventilator can present with temperature instability, worsening gas exchange on ventilator, increased respiratory secretions and suctioning requirements and/or new chest findings with two or more serial chest radiographs revealing at least one of the findings in the form of new or progressive and persistent infiltrate, consolidation, cavitation, or pneumatoceles. Surgical site infections (SSI) contribute a significant percentage of nosocomial infections in children who have undergone cardiac surgery. SSI can be superficial incisional, deep incisional or organ/space SSI. Urinary tract infections (UTIs) also constitute about 7% of all postoperative infections in children following cardiac surgery. Presence of pyuria (urine specimen with ≥10 WBC/mm 3 or ≥3 WBC/high-power field of unspun urine), positive dipstick for leucocyte esterase or nitrite and microorganism present on gram strain of unspun urine are diagnostic clue for UTI. Patients with UTI or SSI may present with systemic manifestations of fever/hypothermia, apnea, bradycardia, lethargy, cough, nausea, and vomiting. The incidence of infective endocarditis (IE) in the first postoperative month is low for most defects and increases with time after surgery. However, when prosthetic valves or conduits are used in surgical repairs and hemodynamic problems persist, the risk for IE is high even in the immediate postoperative period (first 2 weeks after surgery). Morris et al.,  have found highest risk in children who have had repair or palliation of cyanotic CHD or prosthetic aortic valve replacement. There are few studies assessing evaluation of fever in congenital heart disease. Almost half of the normally convalescing patients develop fever in first 24 h of surgery. , This early onset pyrexia usually resolves by 48-72 hours in most of the patients. , During this period, those unfamiliar with cardiac surgical patients frequently order numerous blood, respiratory secretions and urine cultures, white blood cell counts and other special studies without any indication other than fever. The expense of such studies is rarely justified, as fever is due to an inflammatory response to CPB. A statistical difference has been found in the incidence of fever after the third postoperative day between patients without infection and patients with bacteremia, wound infection or pneumonia. The presence of fever 48 hours after surgery should prompt a diligent search for deep-seated infection. Appropriate evaluation of postoperative fever includes a careful history, targeted physical examination, and additional studies if indicated. Age of the patient has a bearing on importance of fever in postoperative period. Young infants with fever are more likely to have an infectious etiology. Patients with poor nutritional status  and immunosuppressed state are more likely to develop nosocomial infection. Attention should be directed to prior known drug hypersensitivity. The duration of surgery, type of surgery (intracardiac or extracardiac), institution and duration of CPB and aortic clamping, and induction of hypothermia are important perioperative variables that influence occurrence of early postoperative fever, which is mostly due to procedure-related systemic inflammatory response syndrome. Few studies have corroborated prolonged CPB time and duration of the surgery as risk factors for nosocomial infections after cardiac surgery in children. ,, Also, details of blood products administered are important in evaluating postoperative fever. The quality of prosthetic material and/or implanted devices should be ascertained especially in cases of suspected IE. Open sternum after the surgery  as well as postoperative reopening of sternum increase the risk for postoperative infections. Intensity and duration of inotropic support have been related to the risk of developing infections correlating with prolonged central line usage. , Nursing information, such as if the patient has diarrhea, respiratory symptoms or has developed skin sores is relevant. Information regarding change in character of sputum or respiratory secretions in ventilated patients or increased suctioning requirements should be sought. A meticulous physical examination should be done on regular basis. Assessment of all vital signs is relevant. A careful search for infectious cause should be made especially in patients with fever persisting after 48 hours postoperatively, high grade fever, hemodynamic instability, presence of metabolic acidosis or lactatemia, or altered glucose homeostasis. Surgical site should be examined for pain and tenderness, purulent discharge, localized swelling, redness, and wound dehiscence. Chest should be examined for signs of pneumonia, effusion, and empyema. Patient with catheter-associated UTI may have associated tenderness in lumbar region or hypogastrium. A careful search for skin sores should be made. Central and peripheral catheter sites should be assessed for thrombophlebitis or cellulitis. Cardiac surgery is associated with an elevated leucocyte count mainly attributable to an increase in the percentage of neutrophils. This increase in the leucocyte count is seen during the first three days after which it normalizes. In the presence of sepsis, leucocyte count may be elevated or depressed for age or there may be >10% immature neutrophils. After CPB, the platelet count falls, primarily due to platelet damage and destruction in the bypass circuit and hemodilution. The platelet count falls by approximately 30% by the conclusion of surgery, reaching a nadir of 40 to 60% on the second or third postoperative day but >10% of patients continue to have a platelet count of <50% of baseline on the fourth postoperative day. Although heparin-induced thrombocytopenia (HIT) has been recognized in adults, there are a few reported cases of HIT in children. , Thrombocytopenia per se is associated with gram negative or fungal sepsis. Peripheral platelet destruction is the mechanism for the thrombocytopenia in sepsis, with the evidence that endotoxin causes morphologic changes, platelet aggregation, and release of thromboplastic phosphatides (platelet factor III) in vitro. It is markedly reduced if the patient progresses to disseminated intravascular coagulation. Quantitative C-reactive protein (CRP) estimation is a valuable laboratory test in the evaluation of febrile young children who are at risk for occult bacteremia and systemic bacterial infection, with a better predictive value than the total leucocyte count or absolute neutrophil count. Procalcitonin seems to have an advantage over CRP because of its earlier increase upon infection and a better negative predictive value, as for example evident in children with fever of unknown origin. An increment of both PCT and CRP is observed just after CPB. PCT values usually peak at 24 hours after surgery (median value 0.77 to 0.79 ng/ ml) , or immediately after CPB (median value 0.58 ng/ ml),  which correlates with the standard range for a low probability of systemic bacterial infection. CRP values usually remain elevated on first 48 hours after CPB (median values 36.6 to 58.82 mg/L on day 1 and median values 13 to 38.3 mg/L on day 2), , which overlap with the standard range of high probability of systemic infection. Also the procalcitonin increase in sepsis often correlates with the severity of the condition and with subsequent mortality. PCT values reported in infected patients are generally higher than in non-infected patients after cardiac surgery and the cutoff point for discriminating infection ranges from 1 to 5 ng/ml, and the dynamics of PCT levels on serial monitoring may be more important than absolute values. Thus PCT scores over CRP in early prediction of sepsis in postoperative cardiac patients after CPB especially those having fever within first 48 hours after cardiac surgery. Diagnosis of laboratory-confirmed BSI is made by at least 1 blood culture positive for recognized pathogen or at least 2 blood cultures positive for common skin contaminant. Ideally, blood specimens for culture should be obtained from two to four blood draws from separate venipuncture sites, and not through a vascular catheter. But, for a pediatric blood draw blood culture may consist of a single bottle because of volume constraints. The ability to exclude bacteremia on the basis of a negative blood culture result depends on the sensitivity and negative predictive value of this test. Many factors influence the yield from blood cultures but the single most important factor is blood volume. When the volume of blood submitted for culture is inadequate, a negative blood culture result is potentially misleading in falsely excluding significant bacteremia. Also, lack of aseptic procedure may lead to the contamination of blood samples, and a high false-positive rate. Pleural fluid, bronchoalveolar lavage (BAL), protected specimen brushing or lung parenchyma culture are minimally contaminated specimens and can be used for etiologic diagnosis of pneumonia. Quantitatively cultured tracheal aspirate has demonstrated performance characteristics (sensitivity, specificity, predictive value) similar to bronchoscopically collected specimens in several studies. ,, Bronchoscopic sampling also entails risks and costs that are greater than that associated with tracheal aspirate or non-bronchoscopic BAL. The ultimate choice of strategy used to diagnose ventilator-associated pneumonia will be dependent on consideration of local expertise and availability of personnel to perform the procedure, perceived risk to the patient, experience, and cost. Chest X-ray should be done for evaluating developing infiltrates, cavitations, and pneumatoceles, especially in patients with clinical signs of pneumonia. It is important to differentiate between effusions due to various causes as infective, heart failure, postpericardiotomy syndrome or simply collected blood utilizing ultrasound-guided aspiration of pleural fluid and analysis. Early postoperative fever with onset within 48 h of surgery is most likely due to the effect of CPB, surgical trauma or transfusion related requiring only symptomatic treatment. Patients having hemodynamic instability, persistent tachycardia, bradycardia, high fever, hypoglycemia or hyperglycemia, metabolic acidosis, persistently elevated lactate levels, preoperative viral illness or partially treated bacterial sepsis should be evaluated for systemic sepsis with blood counts, inflammatory markers (PCT and CRP), blood cultures, and chest X-ray (if chest signs), and appropriate broad spectrum antibiotics should be started pending the culture reports. Patients with high index of suspicion for infection should be started on empirical broad spectrum antibiotics after sending appropriate cultures. The possibility of postpericardiotomy syndrome should be kept in mind in case of onset of fever after 4-5 days of surgery especially if the trends of inflammatory markers and cultures suggest absence of infective pathology. The choice of antibiotics should be guided by the individual unit's infection profile and susceptibility patterns. In our unit we are using combination of second generation cephalosporin and aminoglycoside as first line of antibiotic. For febrile patients with suspected infection who are not toxic and hemodynamically stable, we use a combination of piperacillin-tazobactam or cefoperazone-sulbactam with aminoglycoside. Carbapenems are reserved for patients who are sick and hemodynamically unstable. Gram positive coverage with vancomycin is used for patients with prolonged period of open sternum, ECMO or reexploration of chest. 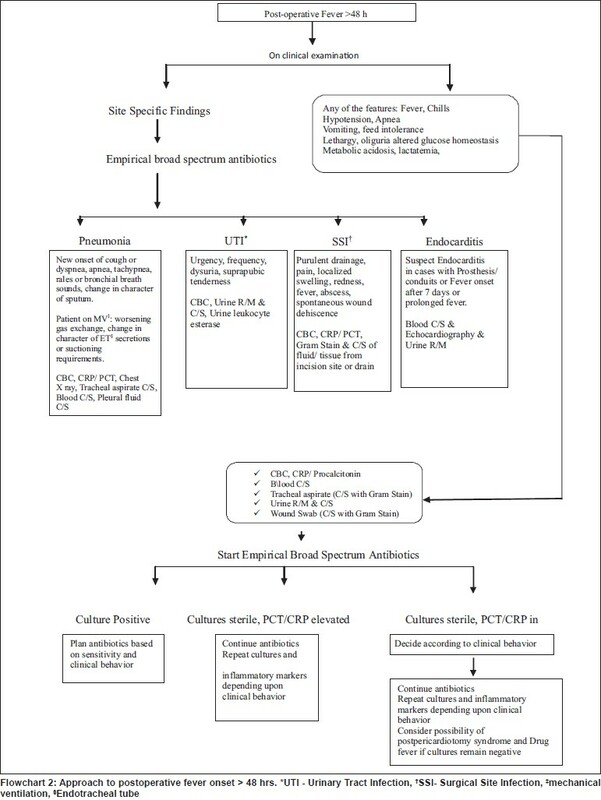 An approach to postoperative fever in pediatric cardiac patients has been summarized in [Flowchart 1] (fever onset <48 hours) and [Flowchart 2] (fever onset >48 hours). Postoperative fever in pediatric cardiac patients while fairly common can be an exasperating and expensive entity. The approach needs to be judicious in choosing the timing of when to intervene and also establish a well-defined process to investigate fever. However, nothing can supplant good clinical acumen and a heightened index of suspicion. 1. Livelli FD Jr, Johnson RA, McEnany MT, Sherman E, Newell J, Block PC, et al. Unexplained in-hospital fever following cardiac surgery. Natural history, relationship to postpericardiotomy syndrome, and prospective study of therapy with indomethacin versus placebo. Circulation 1978;57:968-75. 2. Bell DM, Goldmann DA, Hopkins CC, Karchmer AW, Moellering RC Jr. Unreliability of fever and leukocytosis in the diagnosis of infection after cardiac valve surgery. J Thorac Cardiovasc Surg 1978;75:87-90. 3. Andrade CL, Olvera S, Reyes PA. Fever and infection after heart surgery. A prospective study of 75 cases. Arch Inst Cardiol Mex 1998;59:487-91. 4. Frank SM, Kluger MJ, Kunkel SL. Elevated thermostatic point in postoperative patients. Anesthesiology 2000;93:1426-31. 5. Than P, Málovics I. Significance of postoperative fever after hip prosthesis implantation. Z Orthop Ihre Grenzgeb 2000;138:430-5. 6. Fanning J, Neuhoff RA, Brewer JE, Castaneda T, Marcotte MP, Jacobson RL. Frequency and yield of postoperative fever evaluation. Infect Dis Obstet Gynaecol 1998;6:252-5. 7. Knowles SR, Uetrecht J, Shear NH. Idiosyncratic drug reactions: The reactive metabolites syndrome. Lancet 2000;356:1587-91. 8. Carvalho MV, Maluf MA, Catani R, La Rotta CA, Gomes WJ, Salomão R, et al. Cytokines and pediatric open heart surgery with cardiopulmonary bypass. Cardiol Young 2001;11:36-43. 9. Bert AA. Systemic effects of normothermic cardiopulmonary bypass. Artif Organs 1998;22:77-81. 10. Cremer J, Martin M, Redl H, Bahrami S, Abraham C, Graeter T, et al. Systemic inflammatory response after cardiac operations. Ann Thorac Surg 1996;61:1714-20. 11. Seghaye MC, Grabitz RG, Duchateau J, Bussea S, Däbritz S, Koch D, et al. Inflammatory reaction and capillary leak syndrome related to cardiopulmonary bypass in neonates undergoing cardiac operations. J Thorac Cardiovasc Surg 1996;112:687-97. 12. Lenhardt R, Negishi C, Sessler DI. Perioperative fever. Acta Anaesthesiol Scand Suppl 1997;111:325-8. 13. Verkkala K, Valtonen V, Järvinen A, Tolppanen EM. Fever leukocytosis and C-reactive protein after open heart surgery and their value in the diagnosis of postoperative infections. Thorac Cardiovasc Surg 1987;35:78-82. 14. Aouifi A, Piriou V, Bastien O, Blanc P, Bouvier H, Evans R, et al. Usefulness of procalcitonin for diagnosis of infection in cardiac surgical patients. Crit Care Med 2000;28:3171-6. 15. Mackowiak Pa. Fever. In: Mandell GL, Bennet JE, Polin R, editors. Principles and Practice of infectious diseases. 5 th ed. Philedelphia: Churchill Livingstone; 2000. p. 604-21. 16. McCarthy PL. Fever. Pediatr Rev 1998;19:401-7. 17. Romano MJ, Fortenberry JD, Autrey E, Harris S, Heyroth T, Parmeter P, et al. Infrared tympanic thermometry in the pediatric intensive care unit. Crit Care Med 1993;21:1181-5. 18. Erickson RS, Woo TM. Accuracy of infrared ear thermometry and traditional temperature methods in young children. Heart Lung 1994;23:181-95. 19. Hindman BJ. Emboli, inflammation, and CNS impairement: An overview. Heart Surg Forum 2002;5:249-53. 20. Mitchell JD, Grocott HP, Phillips-Bute B, Mathew JP, Newman MF, Bar-Yosef S. Cytokine secretion after cardiac surgery and its relationship to postoperative fever. Cytokine 2007;38:37-42. 21. Whitten CW, Hill GE, Ivy R, Greilich PE, Lipton JM. Does the duration of cardiopulmonary bypass or aortic cross-clamp, in the absence of blood and/or blood product administration, influence the IL-6 response to cardiac surgery? Anesth Analg 1998;86:28-33. 22. Villasis-Keever MA, Zapata-Arenas DM, Penagos- Paniagua MJ. Frequency of postoperative fever in children with congenital heart disease undergoing cardiovascular surgery and associated risk factors. Rev Esp Cardiol 2002;55:1063-9. 23. Kirklin JK, McGiffin DC. Early complications following cardiac surgery. Cardiovasc Clin 1987;17:321-43. 24. Wernovsky G, Chang AC, Wessel DL, Ravishankar C. Cardiac intensive care. In: Allen HD, Driscoll DJ, Shaddy RE, Feltes TF, editors. Moss and Adams' heart disease in infants, children, and adolescents: Including the fetus and young adults. 7 th ed. Baltimore: Lippincott Williams and Wilkins; 2008. p. 448-80. 25. Beamer NB, Coull BM, Clark WM, Hazel JS, Silberger JR. IL-6 and IL-1 receptor antagonist in acute stroke. Ann Neurol 1995;37:800-5. 26. Grocott HP, Mackensen GB, Grigore AM, Mathew J, Reves JG, Phillips-Bute B, et al. Postoperative hyperthermia is associated with cognitive dysfunction after coronary artery bypass graft surgery. Stroke 2002;33:537-41. 27. Pollock EM, Ford-Jones EL, Rebeyka I, Mindorff CM, Bohn DJ, Edmonds JF, et al. Early nosocomial infections in pediatric cardiovascular surgery patients. Crit Care Med 1990;18:378-84. 28. Dagan O, Cox PN, Ford-Jones L, Ponsonby J, Bohn DJ. Nosocomial infections following cardiovascular surgery: Comparison of two periods, 1987 vs. 1992. Crit Care Med 1999;27:104-8. 29. Valera M, Scolfaro C, Cappello N, Gramaglia E, Grassitelli S, Abbate MT, et al. Nosocomial infections in pediatric cardiac surgery. Infect Control Hosp Epidemol 2001;22:771-5. 30. Dresbach T, Prusseit J, Breuer J, Simon A. Incidence of nosocomial infections in children undergoing cardiac surgery. Rev Med Microbiol 2009;20:74-83. 31. Grisaru-Soen G, Paret G, Yahav D, Boyko V, Lerner- Geva L. Nosocomial infections in pediatric cardiovascular surgery patients: A 4-year survey. Pediatr Crit Care Med 2009;10:202-6. 32. Lomtadze M, Chkhaidze M, Mgeladze E, Metreveli I, Tsintsadze A. Incidence and risk factors of nosocomial infections after cardiac surgery in Georgian population with congenital heart diseases Georgian Med News 2010;178:7-11. 33. Horan TC, Andrus M, Dudeck MA. CDC/NHSN surveillance definition of health care-associated infection and criteria for specific types of infections in the acute care setting. Am J Infect Control 2008;36:309-32. 34. Morris CD, Reller MD, Menashe VD. Thirty-year incidence of infective endocarditis after surgery for congenital heart defect. JAMA 1998;279:599-603. 35. Karl T, Wensley D, Stark J, de Leval M, Rees P, Taylor JF. Infective endocarditis in children with congenital heart disease: Comparison of selected features in patients with surgical correction or palliation and those without. Br Heart J 1987;58:57-65. 36. Pien F, Ho PW, Fergusson DJ. Fever and infection after cardiac operation. Ann Thorac Surg 1982;33:382-4. 37. Mehta PA, Cunningham CK, Colella CB, Alferis G, Weiner LB. Risk factors for sternal wound and other infections in pediatric cardiac surgery patients. Pediatr Infect Dis J 2000;19:1000-4. 38. Galetto-Lacour A, Zamora SA, Gervaix A. Bedside procalcitonin and C-reactive protein tests in children with fever without localizing signs of infection seen in a referral centre. Pediatrics 2003;112:1054-60. 39. Rosanova MT, Allaria A, Santillan A, Hernandez C, Landry L, Ceminara R, et al. Risk factors for infection after cardiovascular surgery in children in Argentina. Braz J Infect Dis 2009;13:414-6. 40. Iwasaka H, Kitano T, Miyakawa H, Unoshima M, Shinguu C, Matsumoto S, et al. Neutrophilia and granulocyte colony-stimulating factor levels after cardiopulmonary bypass. Can J Anaesth 2001;48:81-4. 41. Matthai WH Jr. Thrombocytopenia in cardiovascular patients: Diagnosis and management. Chest 2005;127(2 Suppl):46S-52S. 42. Saiman L, Prince A, Gersony WM. Pediatric infective endocarditis in the modern era. J Pediatr 1993;122:847-53. 43. Porcelli R, Moskowitz BC, Cetta F, Graham LC, Godwin JE, Eidem BW, et al. Heparin-induced thrombocytopenia with associated thrombosis in children after the Fontan operation: Report of two cases. Tex Heart Inst J 2003;30:58-61. 44. Murdoch IA, Beattie RM, Silver DM. Heparin-induced thrombocytopenia in children. Acta Paediatr 1993;82:495-7. 45. Arkader R, Troster EJ, Abellan DM, Lopes MR, Júnior RR, Carcillo JA, et al. Procalcitonin and C-reactive protein kinetics in postoperative pediatric cardiac surgical patients. J Cardiothorac Vasc Anesth 2004;18:160-5. 46. Skrak P, Kovacikova L, Kunovsky Procalcitonin, neopterin and C-reactive protein after pediatric cardiac surgery with cardiopulmonary bypass. Bratisl Lek Listy 2007;108:501-5. 47. Assicot M, Gendrel D, Carsin H, Raymond J, Guilbaud J, Bohuon C. High serum procalcitonin concentrations in patients with sepsis and infection. Lancet 1993;341:515-8. 48. Connell TG, Rele M, Cowley D, Buttery JP, Curtis N. How reliable is a negative blood culture result? Volume of blood submitted for culture in routine practice in a children's hospital. Pediatrics 2007;119:891-6. 49. Brun-Buisson C, Fartoukh M, Lechapt E, Honoré S, Zahar JR, Cerf C, et al. Contribution of blinded, protected quantitative specimens to the diagnostic and therapeutic management of ventilator-associated pneumonia. Chest 2005;128:533-44. 50. Elatrous S, Boukef R, Ouanes Besbes L, Marghli S, Nooman S, Nouira S, et al. Diagnosis of ventilator-associated pneumonia: Agreement between quantitative cultures of endotracheal aspiration and plugged telescoping catheter. Intensive Care Med 2004;30:853-8. 51. Rea-Neto A, Youssef NC, Tuche F, Brunkhorst F, Ranieri VM, Reinhart K, et al. Diagnosis of ventilator-associated pneumonia: A systematic review of the literature. Crit Care 2008;12: R56. 52. Bricker JT, Latson LA, Huhta JC, Gutgesell HP. Echocardiographic evaluation of infective endocarditis in children. Clin Pediatr (Phila) 1985;24:312-7. 53. Ferrieri P, Gewitz MH, Gerber MA, Newburger JW, Dajani AS, Shulman ST, et al. Unique features of infective endocarditis in childhood. Circulation 2002;105:2115-26.